For me, triathlons started way back in the late 1990s when I opened a small business out of my condo. The idea began forming in this vacuous block of concrete known as my head when I turned into the Tasmanian Devil at the end of every day until some meaningful exercise could be had. Around June 2012, after five years of on-and-off preparation and two bouts of prostate cancer, I did one of the white-collar boxing matches held in a local night club, knowing, at the tender age of 52, it would be my last hurrah in the ring. Afterwards my thinking was to start looking into triathlons and other competitive sports that would avoid my getting into a ring or on a mat against someone half my age who didn’t really care that I was twice theirs. And so it began. The hard part was just learning how to swim proficiently and for long distances. I joined various health clubs with swimming classes just to learn how to breathe properly and get the process going. It took a whole year of steady practice in swimming pools to get the form right. If I could learn how to swim, I could do a triathlon…or so the thinking went. My first triathlon was the ITU in late June 2014. Sliding off that barge and into the water was probably one of the toughest internal battles I’ve ever faced. Even after all the training and swimming at Ohio Street Beach, the fear of getting off the barge was palpable. But it was conquered and the day was won (albeit slowly). 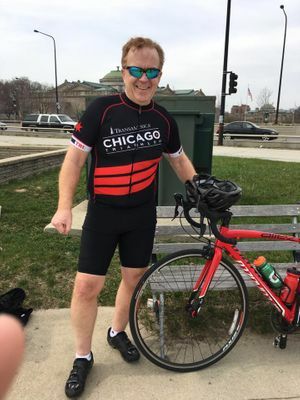 I did two more triathlons (Chicago and North Shore) that year, gassing horribly in August’s Chicago Tri despite thinking I was in shape from working with a trainer all summer. I was starting to realize I needed tri-specific activity and functions. A conversation with long-time friend and Vision Quest proponent, Steve Jensen, started with me saying I needed to get better at biking and running and finished with him introducing me to VQ. So, what does VQ bring to my triathlon training? 1. Good coaching from thoughtful, intelligent coaches who watch students in class and offer suggestions for improvement. 2. Discipline through the winter months to stay invested in the training and not let bad habits creep in. Biking, swimming and indoor/outdoor running all help athletes stay in shape. 3. An environment to train with better athletes, thereby pushing the bar higher. 4. The opportunity to go to class, be social and feel part of the VQ community--a big draw for someone who still works out of his condo in Lincoln Park. While many businesses today are being disrupted by technology, Vision Quest strives to remain on the cutting edge. Technology can be difficult for a client like me who sits at the tail end of a long life as a weekend warrior athlete. VQ finds ways over and over to blend high tech with low tech training for a greater balance of offerings to add more value for clients. It’s the fluid combination of community, coaching and training that are the valuable aspects I see with VQ. There is old saying about life: no progress is made without real pain and suffering. Without a doubt, VQ will help you make progress!